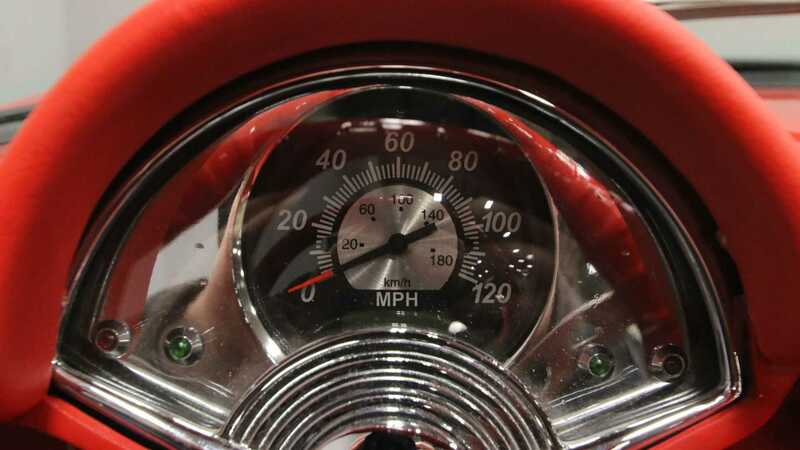 This freshly restored and customized 1956 Chevrolet Corvette C1 Restomod convertible with just five miles on the odometer is perfect for weekend boulevard cruising. 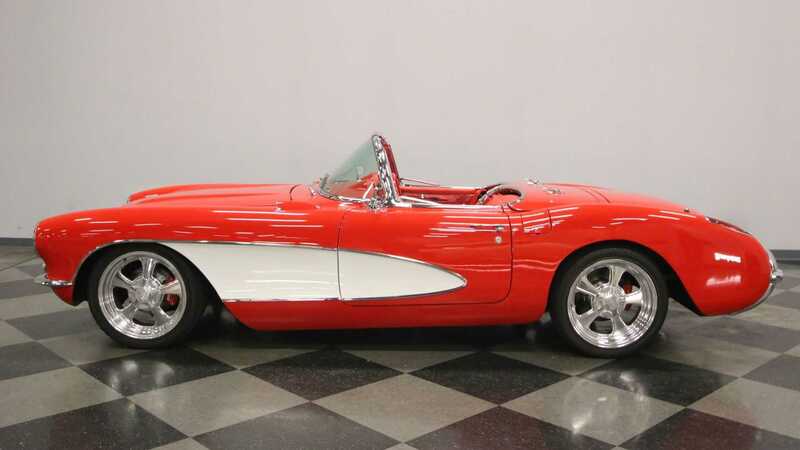 Chevrolet introduced the first-generation Corvette C1 in 1953 in order to compete with the European sports car manufacturers and to provide America with its very own sports car. 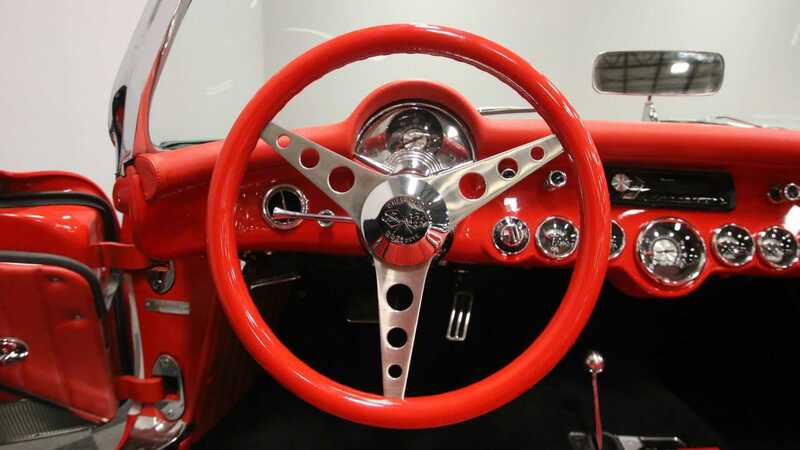 The C1 Vette is commonly referred to as the "solid-axle" generation because Chevy did not introduce the independent rear suspension to the Corvette lineup until the second-generation C2 Stingray arrived in 1963. 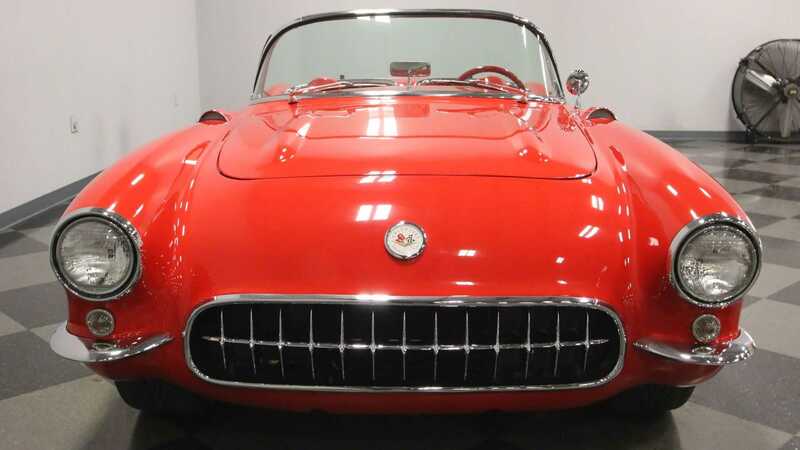 During its near decade-long production run from 1953 until 1962, the Corvette C1 was available with four engine options ranging from a 235 cubic-inch, 3.9-liter Blue Flame inline-six with 150-horsepower to a 327 cubic-inch, 5.4-liter small-block V8 with power output ranging from 250-hp to 360-hp depending on the choice of carburetor or fuel injection, camshaft, cylinder heads, pistons, and intake manifold. 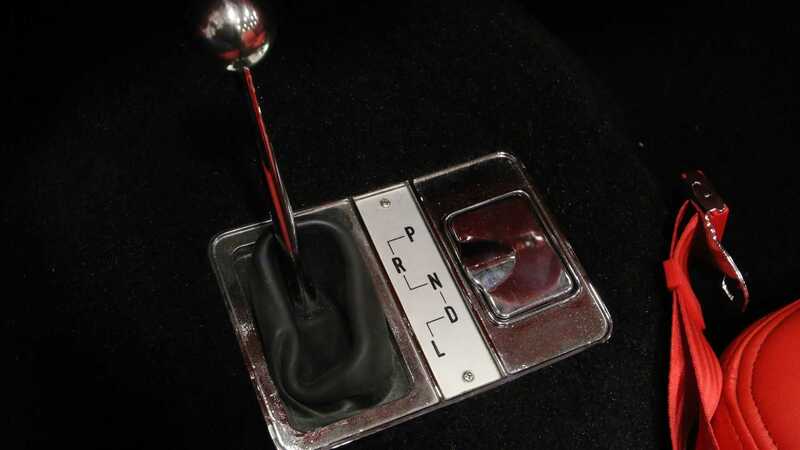 Based on the engine choice selected, they were either paired to a two-speed Powerglide automatic, a three-speed manual, or a four-speed manual transmission and sent the power to the rear wheels. 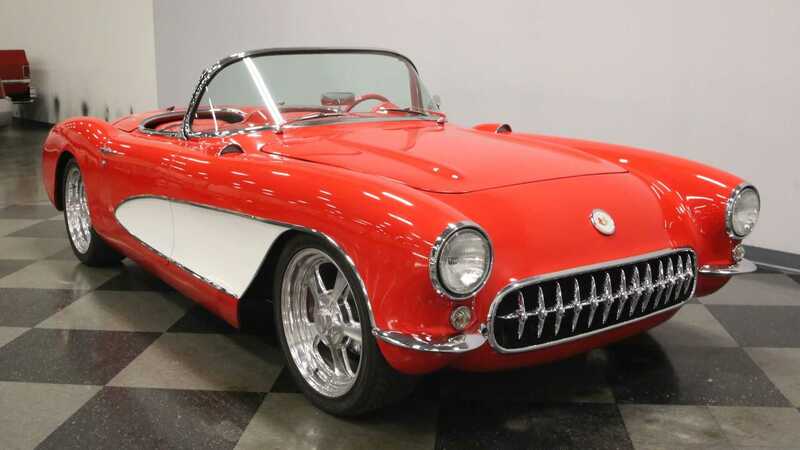 However, this particular 1956 Chevrolet Corvette C1 Restomod currently for sale at Streetside Classics in Nashville, Tennessee does not retain any of the components found in a factory-spec Corvette C1. 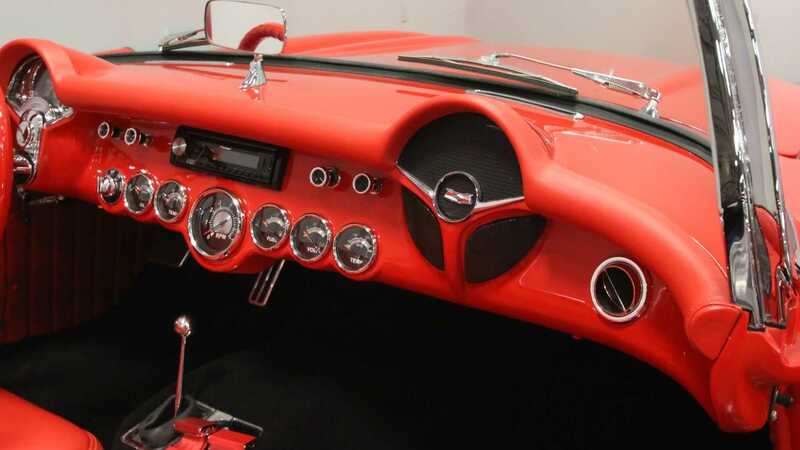 This Corvette is lower and leaner than other first-generation models because it has recently come out of a first-class restoration and modification process which enabled this car to retain its classic 1956 Corvette looks while adopting a modern running gear underneath it. 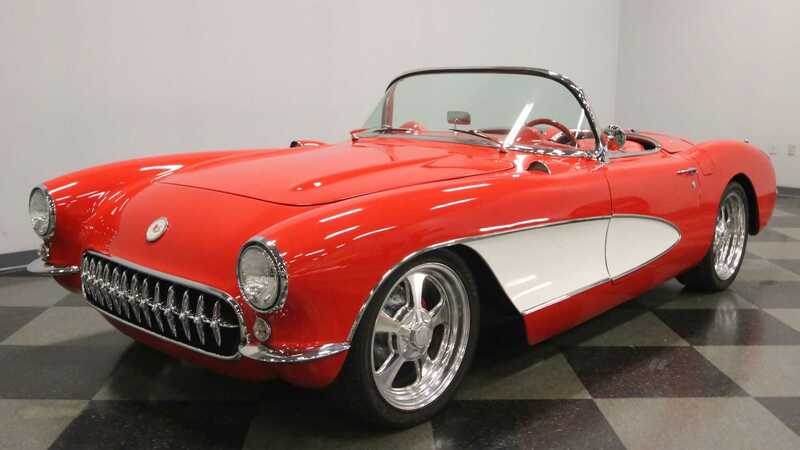 When compared to a bone-stock Corvette C1, there are many, but subtle differences between it and this restomod. 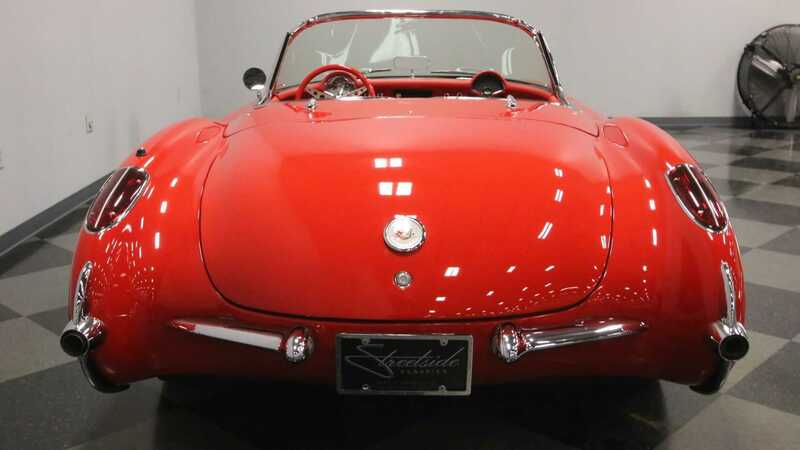 For example, the headlights are now perched out on new extended front fenders, the bumpers on each side of the grill bend around the corner to connect with the chrome outlines of the new cove in the side of the body, and the rear fenders bend up and over the rear wheels and then down to meet the trunk line of the bumper. 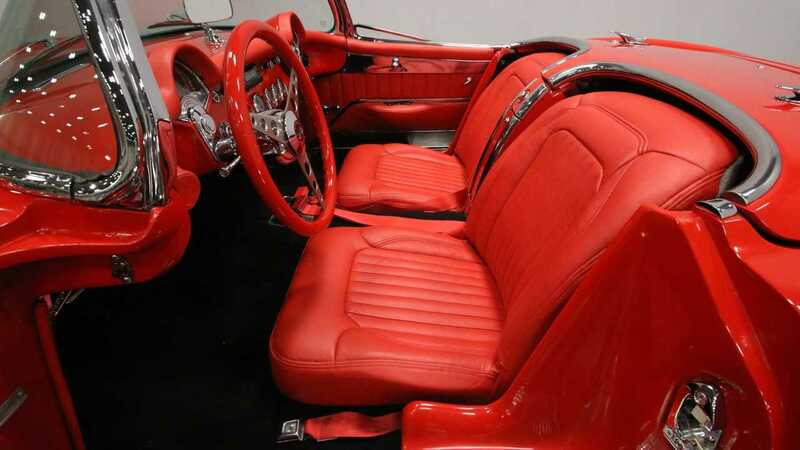 The interior of this Corvette C1 Restomod is covered in rich red leather which perfectly complements the two-tone red and white paint scheme on the exterior. 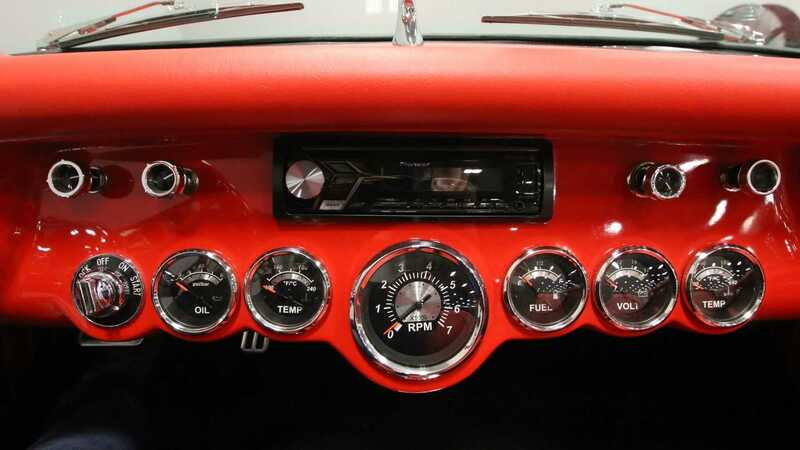 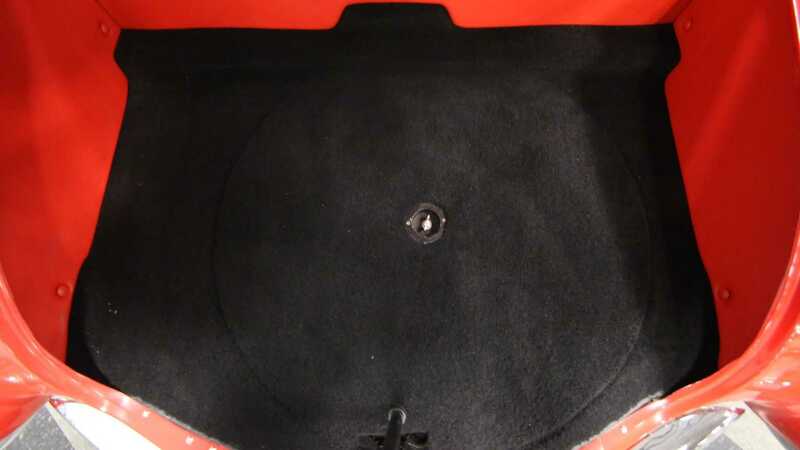 The cabin also features a red steering wheel which is mounted on a brushed metal three spoke hub, a Pioneer stereo system, and a wedge-shaped speedometer pod. 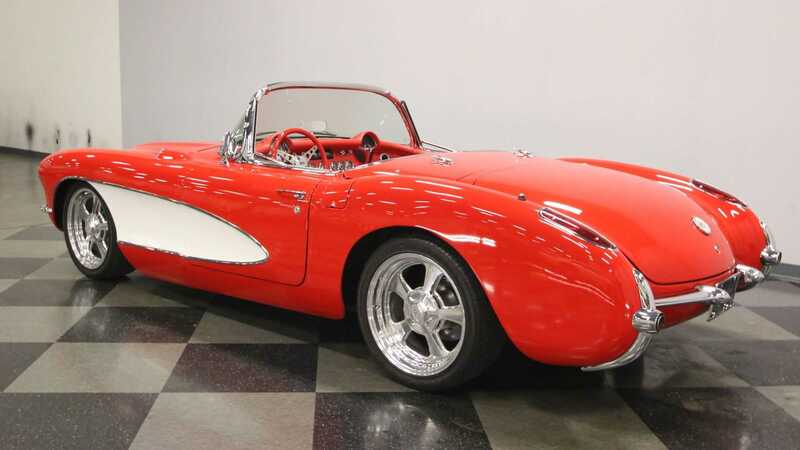 This 1956 Corvette C1 Restomod is powered by a 6.0-liter LS2 small-block V8 and is mated to a modern four-speed automatic transmission. 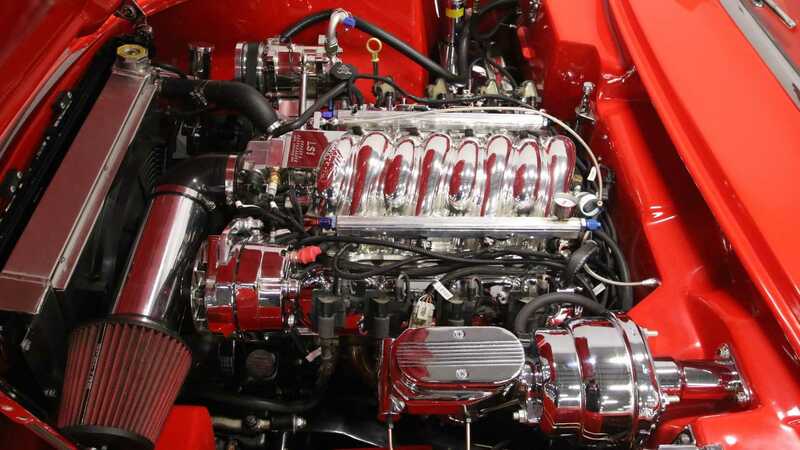 Underneath the body, this Vette features a modern coil-over suspension setup with tubular A-arms in the front and a four-link rear end. 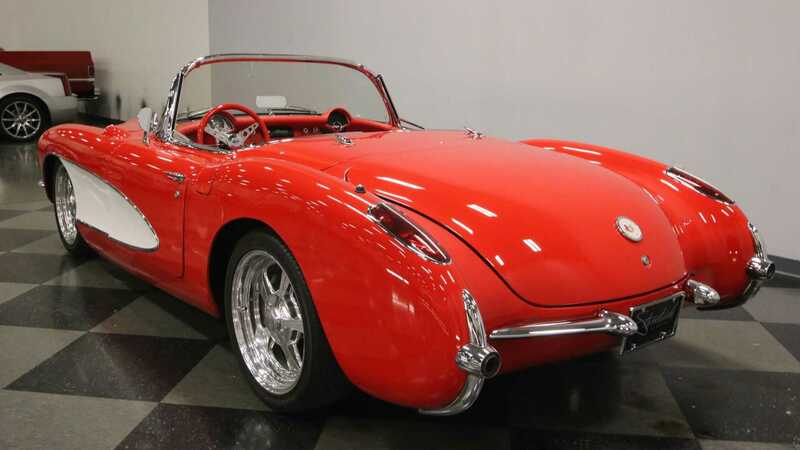 A Wilwood four-wheel disc brake system with drilled and vented rotors bring this restomod to a complete stop in a safe distance. 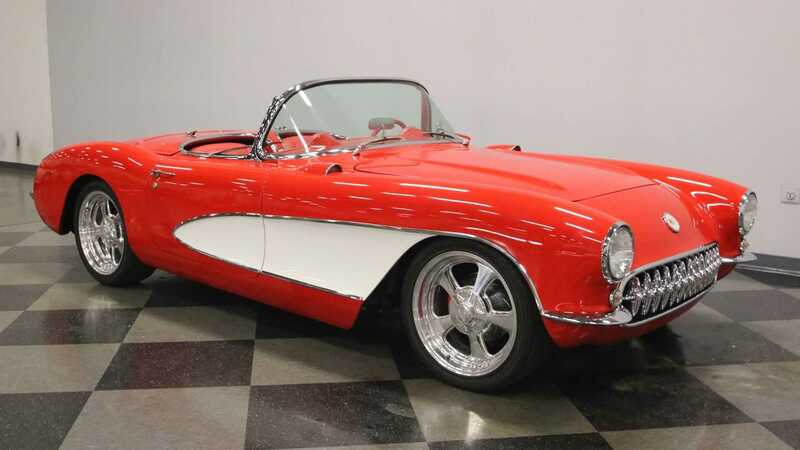 A special set of 18-inch chrome wheels with 235/40R18 tires on all four corners completes the handling package of this Vette. 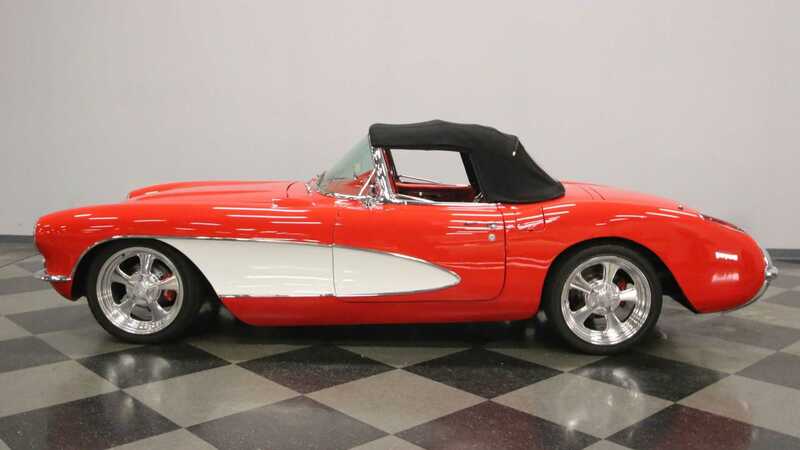 If you are currently in the market for a retro Corvette with modern mechanical components underneath it, then this 1956 Chevrolet Corvette C1 Restomod currently for sale at Streetside Classics for $139,995 is what you have been waiting for.